Dr. Harold Vinegar: Conventional oil is what everyone imagines. You drill a well and oil comes out of the well under the natural forces in the ground and you basically have an oil and gas well, but there’s a whole other class of oil called “unconventional oil.” This means that when you drill those wells, the oil will require some special treatment in the sub surface in order to get it to move. Dr. Harold Vinegar: Our company has mapped over 250 billion barrels of recoverable oil in Israel and that’s a conservative estimate. To put that in perspective, Saudi Arabia has about 250 billion barrels of conventional oil reserves in the ground. What has happened with time is conventional oil has gotten more expensive and unconventional oil has gotten less expensive because there’s a small amount of conventional oil left in the world. Its price is driven by scarcity and as it becomes scarcer, the price goes up. Whereas unconventionals have enormous reserves, they swamp the amount of conventionals. Orders have more magnitude but their cost is driven by technology and if technology improves, the unconventional gets cheaper. Starting a few years ago, they’ve crossed over. The two supply curves have crossed so that marginally the conventional oil that the companies are going after in the Arctic, deep offshore, are actually more expensive than the development of the unconventional, such as the tar sands in Canada and the oil shales in Israel. It’s a flip. Things have changed. Dr. Harold Vinegar: Our company has a website, http://iei-energy.com, and you can read about our developments here. I think the takeaway message that I would like to give is that Israel has an extremely bright energy future. 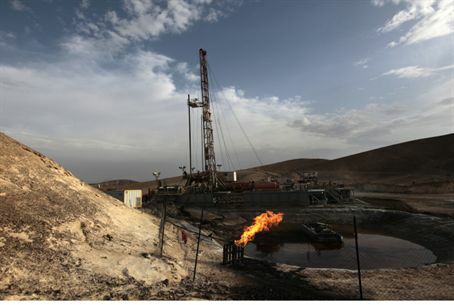 The growth of the natural gas discoveries and the Mediterranean as well as the enormous oil shale deposits on shore means that Israel is going to be a major oil and gas exporting country in the future. Things are really exciting here. Douglas Goldstein, CFP®, is the director of Profile Investment Services and the host of the Goldstein on Gelt radio show (Monday nights at 7:00 PM on www.israelnationalradio.com. He is a licensed financial professional both in the U.S. and Israel. For past episodes of Goldstein on Gelt click here. Disclaimer: This document is a transcription and/or an educational article. While it is believed to be current and accurate, divergence from the original is to be expected. The original podcast can be heard at https://sites.google.com/site/goldsteinradioshows/. All information on this website is purely information and should not be used as the sole basis for making financial decisions. The opinions rendered herein are those of the guests, and not necessarily those of Douglas Goldstein, Profile Investment Services, Ltd., or Israel National News. Readers should consult with a professional financial advisor before making any financial decisions.